Are you ready to take a safari through the North Georgia Mountains? 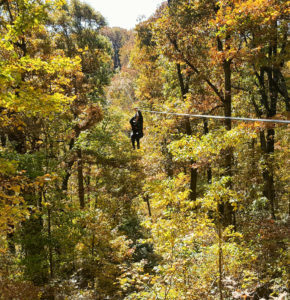 At Amicalola Zipline and Aerial Adventure Park, you and your family now have the opportunity to enjoy stunning scenery, thrilling ziplines and some crazy fun suspension bridges as you hike through the trees at Amicalola Falls State Park. Our F4 Canopy Tour is specifically designed for our young adventure seekers who are at least 8 years old and weigh a minimum of 50lbs. This tour consists of the first 4 lines of our Level 1 tour. $29 per person Minimum weight is 50 lbs and must be at least 8 years old. 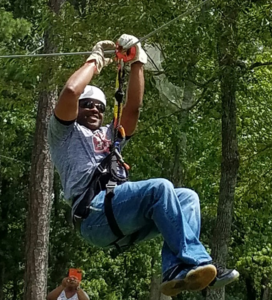 Our level 1 zip line canopy tour is approximately 1 ½ to 2 hours of heart pounding FUN! This tour consist of 9 ziplines that range from 75 feet to 1000 feet in length including 3 sky trek suspension type bridges. Heights range from 20 to 100 feet in the air! You will enjoy bird’s eye views from the tops of the tree canopy and enjoy some very cool ziplines. Be prepared to spot wildlife and beautiful views of Amicalola State Park. Explore areas of Amicalola that ARE NOT available to hikers! $99.00 per person. Minimum weight is 95 lbs. Must be at least 10 years old for this tour. Maximum weights for all participants: Girls must weigh under 250 lbs and Guys must weigh under 285 lbs. We do require a minimum of two participating guests to open a tour time or continue a tour.